Comparing two numbers written in index form like 211 and 37 is not difficult, as any calculator would confirm that 211 = 2048 37 = 2187. However, confirming that 632382518061 519432525806 would be much more difficult, as both numbers contain over three million digits. 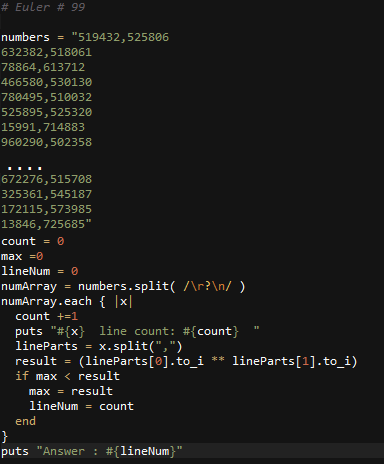 Using base_exp.txt , a text file containing one thousand lines with a base/exponent pair on each line, determine which line number has the greatest numerical value.